In the Fall semester, seventy-five years after Anna Flanigen and Gertrude Pierce enrolled in Chemistry classes, a total of 4,234 women were enrolled in 24 different academic programs. The majority of women students (2,273 or 53.68%) continued to attend classes on a part time basis, but the number enrolled in courses leading to degrees had increased substantially (2,441 or 57.65%). The College for Women, offering its undergraduate liberal arts degree, had clearly met a real need at Penn. With 695 full time students, the College enjoyed an enrollment of women more than twice that of any other undergraduate school. 326 women were enrolled in the undergraduate programs of the School of Education; 174 in those of the School of Nursing; 83 in the School of Allied Medical Professions; 50 in the School of Fine Arts; and 19 in the College Collateral Courses. Among the graduate and professional schools, 99 full time women students were enrolled in the School of Social Work, more than twice the number enrolled in any other professional degree program. 43 women were enrolled in the graduate, professional-degree programs of the School of Education; 21 in the School of Medicine; 16 in the Graduate School of Medicine; 15 in the Law School; 12 in the Graduate School of Arts and Sciences; and six in the Wharton School. 868 women students were enrolled in part time courses leading to degrees: 253 were working toward masters and doctoral degrees in the Graduate School of Arts and Sciences; 230 in the School of Education; 74 in the School of Social Work; nine in the Wharton School, and four in the School of Fine Arts. 179 women were enrolled in part time classes leading to an undergraduate degree in the School of Nursing; 41 in the College Collateral Courses; 34 in the School of Education; 29 in the School of Allied Medical Professions; and 12 in the School of Fine Arts. 1,793 women students were enrolled in courses that did not lead to a degree: 388 full time students in the HUP School of Nursing; 797 part time students in the College Collateral Courses; 346 students in the Extension schools of Nursing, Wharton, and Education; 187 in the Wharton Evening School; and 75 in the Oral Hygiene program of the School of Dental Medicine. Women had also made major advances in the ranks of the faculty. Women had won appointments to the standing faculty in thirteen of the fifteen schools of the University. Only the faculties of Law and Engineering had failed to appoint or promote a woman to the rank of Assistant Professor or higher. Women held tenured faculty positions in nine of the fifteen – the School of Medicine, the Wharton School, the Graduate School of Arts and Sciences, the School of Education, the School of Fine Arts, the College of Liberal Arts for Women, and the schools of Social Work, Allied Medical Professions, and Nursing – and women held full or senior professorships in seven of those nine (Dr. Florence B. Seibert would not become Professor of Biochemistry in the School of Medicine until 1955 and no woman would hold a senior professorship in the School of Fine Arts until 1958). At the Commencement held on 10 February, the University awarded the degree of Bachelor of Science in Nursing Education to twenty-eight graduates of the School of Nursing. These were the first women to earn the B.S.in N.Ed. degree at Penn. At the Commencement held on 13 June, the University awarded the degree of Doctor of Social Work to Anita J. Faatz, Goldie Basch Faith, Elizabeth Alston Lawder, and Rosa Wessel. They were the first women to earn the D.S.W. degree at Penn. At the Commencement held on 18 June, the University awarded the School of Allied Medical Profession’s degree of Bachelor of Science in Occupational Therapy to Josephine Cohen, Marie Antoinette Robbins, and Thelma M. Thoms. They were the first women to earn the B.S. in O.T. degree at Penn. 203 years after Benjamin Franklin organized the first Trustees and twenty-five years after the Trustees were divided into three classes – Life, Term, and Alumni Trustees – Katharine Elizabeth McBride was elected one of the Term Trustees of the University. Dr. McBride had succeeded Marion Edward Park as President of Bryn Mawr College in 1942; had been awarded Penn’s honorary degree of Doctor of Laws (LL.D.) that same year; and had also been elected an Associate Trustee of the University, serving as a member of the Trustees’ Board of Graduate Education and Research. She was the first woman elected a Trustee of the University. In June she was elected a Term Trustee, to serve for ten years. Less than a year later, in May 1953 she was elected by her fellow Trustees to the Executive Committee of the Trustees. She was the first woman to serve the University as a member of the Executive Committee of the Trustees. In 1962, when her ten-year term expired, Dr. McBride was re-elected a Term Trustee. She served as a Term Trustee another four years, until her resignation in 1966. At the Commencement held on 10 June, the University awarded the School of Allied Medical Profession’s degree of Bachelor of Science in Physical Therapy to Martha Bodine. She was the first woman to earn the B.S. in P.T. degree at Penn. In February, the University announced that in the fall semester, for the first time, women would be admitted to the undergraduate programs of the School of Engineering and Applied Science and the Wharton School. These programs had been the last at Penn to exclude women. In September, fifteen undergraduate women enrolled in the Wharton School, nine of whom earned the degree of Bachelor of Science in Economics (B.S. in Econ.) by June 1958. Barbara G. Mandell was the first woman to enroll in the School of Engineering and Applied Science. In March, the University appointed Dwight B. McNair Scott, M.D., to the faculty position of Assistant Professor of Physiological Chemistry in Medicine, in the School of Medicine, effective retroactively to 1 January 1954. In July 1956, Dr. Scott, a woman, was reappointed and her title changed to Assistant Professor of Biochemistry in Physiology. Also in March, the University appointed Catherine C.L. Bacon, M.D., to the faculty position of Associate Professor of Psychiatry in the Graduate School of Medicine, effective retroactively to 25 January 1954. In July 1955 the University promoted her within the School of Medicine (not the Graduate School of Medicine) to the faculty position of Associate Professor of Clinical Psychiatry. The Wharton School appointed Jean Andrus Crockett, B.A., M.A., Ph.D., to the faculty position of Assistant Professor of Finance. She was the first woman to join the standing faculty of the Wharton School in one of its departments of business education. In 1959 the Wharton School promoted her to Associate Professor of Finance and in 1965 to full Professor of Finance. She was the first woman to earn tenure and the first woman to hold a senior professorship in one of the departments of business education at the Wharton School. In October, the Trustees elected the first woman Trustee, Katharine Elizabeth McBride, the first Chair of the Advisory Board of Teacher Education and Practice. She was both the first woman member of the Board and the first woman Chair. At the same October meeting, the Trustees elected Helen Cheyney Bailey (B.S. in Ed., 1919) an Associate Trustee of the University with membership on the Advisory Board of Teacher Education and Practice. She was the only woman among the Associate Trustees elected to the first Advisory Board of Teacher Education and Practice. In December, the Trustees elected Lucile Petry Leone an Associate Trustee of the University with membership on the Advisory Board of Medical Education and Research. She was the first woman with oversight responsibilities for the schools of Dental Medicine, Medicine, and Veterinary Medicine. In March, the University appointed Rachel Ash, M.D., to the faculty position of Associate Professor of Cardiology in Pediatrics in the Graduate School of Medicine. In May, the University appointed Neva Abelson, M.D., to the faculty position of Associate Professor of Pediatrics in the School of Medicine. At the Commencement held on 15 June, the University awarded the School of Fine Arts’ degree of Master of City Planning to Janet Ruth Scheff. She was the first woman to earn the M.C.P. degree at Penn. In October, the Trustees elected Mary Todhunter (Clark) Rockefeller (“Mrs. Nelson A. Rockefeller”) an Associate Trustee with membership on the Advisory Board of Medical Education and Research. At the Commencement held on 11 February, the University awarded the School of Allied Medical Professions’ degree of Bachelor of Science in Medical Technology to Nancy Newlin. She was the first woman and the first person to earn the B.S. in M.T. degree at Penn. At the Commencement held on 13 June, the University awarded the Wharton School’s undergraduate business degree, the Bachelor of Science in Economics, to Carole Berman Silk. She was the first woman to earn the B.S. in Econ. degree at Penn. Also at the Commencement of June 1956, the University awarded the degree of Master of Laws to Paula Rudy Markowitz. She was the first woman to earn the LL.M. degree at Penn. In October, the University promoted Elizabeth Farquhar Flower from the faculty position of Assistant Professor of Philosophy in the College of Arts and Sciences to that of Associate Professor, effective retroactively as of 1 July 1956. She was the first woman to earn tenure in the College of Arts and Sciences. At the Commencement held on 12 June, the University awarded the School of Allied Medical Professions’ degree of Bachelor of Science in Oral Hygiene to Marilyn Smith Hipple. She was the first woman and the first person to earn the B.S. in O.H. degree at Penn. Academic year 1957-58 was the final year in which the University published an independent Bulletin for the College of Liberal Arts for Women containing “detailed information concerning the admission requirements and courses” in that the College. The list of Officers of Instruction in the College for Women included only eight women in the 170-member, standing faculty: Dorothy Swaine Thomas, Professor of Sociology in the Wharton School; Hildegarde J. Farquhar, Associate Professor of Physical Education; Elizabeth Farquhar Flower, Associate Professor of Philosophy in the College of Arts and Sciences; Joyce Michell, Associate Professor of Music; Eleanor S. Boll, Assistant Professor of Sociology; Elizabeth R. Burdick, Assistant Professor of Physical Education; Mildred L. Sylvester, Assistant Professor of Psychology; and Malvena Taiz, Assistant Professor of Physical Education. Only two of the eight – Associate Professor Flower and Assistant Professor Sylvester – held their primary appointments in the College of Arts and Sciences [for Men]. In addition, there were four women not members of the standing faculty, including the two senior academic administrators: R. Jean Brownlee, Vice-Dean and Associate in Political Science; Virginia Kinsman Henderson, Lecturer in Marriage Relations; Althea Kratz Hottel, Dean of Women and Lecturer in Sociology; and Elizabeth B. Hurlock, Associate in Psychology. The School of Engineering and Applied Science appointed [Clara Johanne] Doris Kuhlmann-Wilsdorf, B.S., M.S., Ph.D., a mechanical metallurgist, to the faculty position of Research Associate Professor of Metallurgical Engineering (the present-day department of Materials Science and Engineering), effective 1 July. She was the first woman to join the standing faculty of the School of Engineering and Applied Science. In 1960 the School reappointed her and changed her title to Associate Professor of Metallurgy. She was therefore the first woman to earn tenure in the School of Engineering and Applied Science. Just one year later, in July 1961, the School promoted her to Professor of Metallurgical Engineering. She was therefore the first woman to hold a senior professorship at the School of Engineering and Applied Science. In 1963, however, Professor Kuhlmann-Wilsdorf left Penn to accept an appointment as Professor of Engineering Physics at the University of Virginia. There she flourished, eventually being promoted to University Professor of Applied Science. In 1994 she was honored by election to the National Academy of Engineering, with membership in the Materials Engineering section of the Academy. The University appointed Ruth Elizabeth Smalley to the academic administrator position of Dean of the School of Social Work. She was the first woman to be appointed Dean of that School and the second woman to be named an academic dean at Penn. The School of Fine Arts promoted Stanislawa Nowicki, M. Arch., from the faculty rank of Associate Professor to that of Professor of Architecture. She was the first woman to hold a senior professorship at the School of Fine Arts. At the Commencement held on 8 February, the University awarded the degree of Master of Landscape Architecture to Marilyn Harriet Johnson. She was the first woman to earn the M. L. Arch. degree at Penn. At the Commencement held on 11 June, the University awarded the degree of Bachelor of City Planning to Alice Bernice Kalman and Carolyn Joan Sehl. They were the first women to earn the B.C.P. degree at Penn. Academic year 1958-59 was the first year in which the University published a combined Bulletin for all undergraduate programs of study at Penn. It took the title Undergraduate Catalogue and included the College of Arts and Sciences [for men], the College of Liberal Arts for Women, the five Engineering Schools (Chemical Engineering, Civil Engineering, Electrical Engineering, Mechanical Engineering, and Metallurgical Engineering), the Wharton School, the School of Education, the School of Fine Arts, the School of Nursing, and the School of Allied Medical Professions. Madeleine M. Joullie, Associate in Chemistry; Malvena Taiz, Associate Professor of Dance and Assistant Professor of Physical Education; Jenneatte P. Nichols, Associate Professor of History; Stella Kramrisch, Professor of the History of Art, Professor of Oriental Studies and Professor of South Asia Regional Studies; Charlotte Epstein, Professor of Human Relations; Virginia K. Henderson, Lecturer in Marriage; Joyce Michell, Associate Professor of Music; Elizabeth F. Flower, Associate Professor of Philosophy; Hildegarde J. Farquhar, Associate Professor of Physical Education; Elizabeth R. Burdick, Assistant Professor of Physical Education; Doris K. Welsh, Assistant Professor of Physical Education; Elizabeth K. Ralph, Associate in Physics; Anna A. Pirscenok, Instructor in Slavic Languages and Literature; and Dorothy M. Spencer, Lecturer in South Asia Regional Studies. [Clara Johanne] Doris Wilsdorf, B.B.S., M.S., and Ph.D. in Materials Science, all three degrees awarded by the University of Gottingen, and D.Sc., University of the Witwatersrand in Johannesburg, South Africa, 1954, was an Associate Professor of Metallurgical Engineering in the School of Engineering and Applied Science. Her research was in the area of solid state physics. She was promoted to full Professor in the 1960-61 academic year. 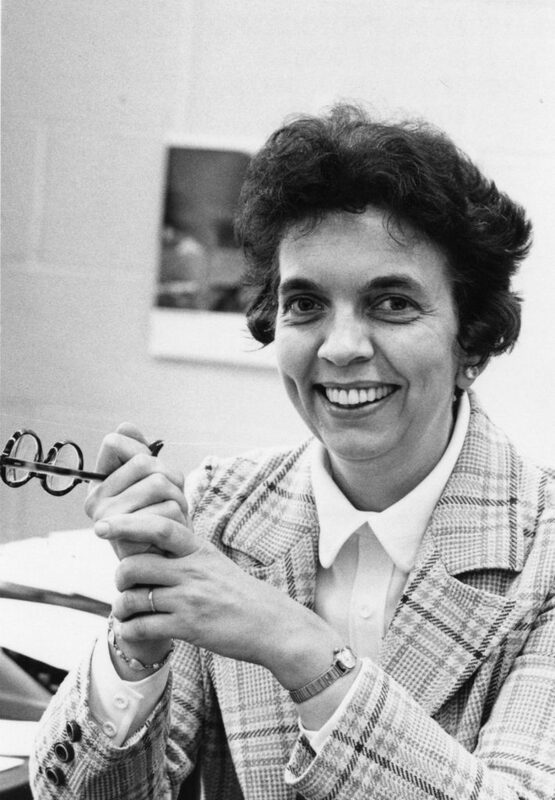 In later years she became University Professor of Applied Science in the Department of Materials Science and Engineering at the University of Virginia. R. Jean Brownlee, Associate in Political Science; Dorothy Swaine Thomas, Professor of Sociology; Eleanor S. Boll, Assistant Professor of Sociology; Althea K. Hottel, Lecturer in Sociology; and Nancy L. Schnerr, Lecturer in Statistics. Mary E. Coleman, Associate Professor of Education; Helen Huus, Associate Professor of Education; Eleanor Dillinger, Assistant Professor of Education; Helen E. Martin, Assistant Professor of Education; Jean Straub, Assistant Professor of Education; Mary M. Lang, Lecturer in Education; Mabel L. Price, Lecturer in Education; Alice K. Watson, Lecturer in Education; and Margaret F. Willson, Lecturer in Education. Theresa I. Lynch, Professor of Nursing and Dean of the School; Adaline chase, Associate Professor of Nursing; Mary E. Beam, Assistant Professor of Nursing; Geraldine L. Ellis, Assistant Professor of Nursing; Marth A. Hunscher, Assistant Professor of Nursing; Casmira A. Marciniszyn, Assistant Professor of Nursing; Dorothy R. Marlow, Assistant Professor of Nursing; and Mary D. Shanks, Assistant Professor of Nursing. Harriet M. Boyd, Assistant Professor of Medical Technology and Director of the Division of Medical Technology; Cornelie A.J. Goldberg, Instructor in Medical Technology; Virginia L. Yonan, Instructor in Medical Technology; Helen S. Willard, Professor of Occupational Therapy; Clare S. Spackman, Associate Professor of Occupational Therapy; Virginia W. Cute, Assistant Professor of Occupational Therapy; Dorothy E. Baethke, Professor of Physical Therapy; Stella Y. Botelho, Associate Professor of Physical Therapy; Eleanor J. Carlin, Associate Professor of Physical Therapy; and Rheta A. Weidenbacker, Associate in Physical Therapy. At the suggestion of Dean Theresa I. Lynch, President Gaylord P. Harnwell established the Advisory Council of the School of Nursing. The Advisory Council was not an Advisory Board of the Trustees, but an oversight board that existed at the pleasure of the Dean and the President. Its purpose was to “provide such assistance and advice to the officers of the School of Nursing as may be requested from time to time.” President Harnwell appointed Ella (Read) Brewster (1898-1998) Chair of the Advisory Council. She was the first woman to chair an oversight committee of the School of Nursing. At the Commencement held on 10 June, the University awarded the degree of Bachelor of Science in Electrical Engineering to Marcia Marie Ferris. She was the first woman to earn the B.S. in E.E. degree at Penn. In June, after twenty-three years as a senior administrative officer at Penn, Althea Kratz Hottel retired from the position of Dean of Women. In recognition of her leadership among women at Penn, the University established the first modern women’s senior class leadership award (see first entry in 1959 above). In July, the University appointed Stella Kramrisch, Ph.D. (Hon. LL.D., 1981), to the senior faculty position of Professor of South Asian Art in the Department of South Asia Regional Studies in the Graduate School of Arts and Sciences. She had previously held the faculty position of Visiting Research Professor of Oriental Studies in the Graduate School, a five-year appointment, effective from July 1954 through June 1959, and supported throughout that period by the Bollingen Foundation. In August, the University announced the appointment of Laura A. Bornholdt, B.A., M.A., Ph.D., to the senior administrative position of Dean of Women. Prior to accepting her appointment at Penn, Dr. Bornholdt had served as Dean of Sarah Lawrence College in Bronxville, New York. She had earned the degrees of Bachelor of Arts and Master of Arts at Smith College, where she had won election to Phi Beta Kappa, the national honorary society for scholastic excellence. She had earned the degree of Doctor of Philosophy in History at Yale University. Her appointment at Penn included a lectureship in Penn’s Department of History. Dr. Bornholdt was appointed to succeed Althea Kratz Hottel, who had retired in June. In October, the Trustees elected Althea Kratz Hottel a Term Trustees of the University. She had retired from the position of Dean of Women just four months earlier, but volunteered to continue as the head of the fundraising campaign for the new women’s residence hall. She was the second woman to serve as a Term Trustee. She was re-elected a Term Trustee in 1964 and served until the expiration of her second term in 1969. In February, the University appointed Rebecca Jean Brownlee (B.S. in Ed., 1934; M.A., 1936; Ph.D. in Political Science, 1940) to the academic administrator position of Dean of the College of Liberal Arts for Women. She was the first woman to be appointed Dean of that College and the third woman to be named an academic dean at Penn. It should be noted, however, that Dean Brownlee did not hold the customary authority and standing traditionally accorded the office of an academic Dean. Perhaps this was due to the unique organization of the College for Women, which, as stated in the 1960-61 Undergraduate Catalogue, “maintain[ed] no separate faculty but dr[ew] upon the faculties of other schools of the University for its instructional staff.” This may explain why the appointment of Dr. Brownlee to the position of Dean was not accompanied by an academic appointment. In May 1959, the University had promoted her to Assistant Professor of Political Science in the Wharton School, but she was the only academic dean at Penn not to be a tenured member of the faculty. In May, the Trustees elected Lillian G. Burns, B.A., M.A., to the senior administrative position of Assistant Secretary of the University. Prior to her election as Assistant Secretary, Ms. Burns had served in a series of increasingly responsible administrative positions at Penn. She was first employed in 1950 as an assistant to the Dean of Women in charge of women’s residences. She advanced, in succession, to Assistant Dean of Women, Assistant to the Business Vice President, and Assistant to the Secretary of the University. In 1959, at the founding of the West Philadelphia Corporation, University President Gaylord P. Harnwell was elected President of the Corporation and Lillian G. Burns was elected Secretary. She was re-elected Secretary in every subsequent year until her departure from Penn in 1969. In October 1968, she was also elected a Director of the West Philadelphia Corporation. In her work with the West Philadelphia Corporation, Lillian Burns was fully engaged in the acquisition of land for the University City Science Center. In October 1962, President Harnwell announced the appointment of Ms. Burns to the position of Associate Planning Coordinator in the Office of the President. In January 1965, President Harnwell announced the promotion of Ms. Burns to the position of Coordinator of Planning for the University. In September 1969, shortly after the retirement of President Harnwell, Lillian Burns left Penn to become Administrator of the American Cities Corporation in Columbia, Maryland. In the years beginning in 1960 and continuing through 1969, Ms. Burns was the highest ranking woman administrative officer in the central administration of the University. At the Commencement held on 15 June, the University awarded the degree of Bachelor of Science in Chemical Engineering to Leona Frances Wirt. She was the first woman to earn the B.S. in Ch.E. degree at Penn. Also at the Commencement of June 1960, the University awarded the Annenberg School’s degree of Master of Arts in Communications to Susan Barrett Atwood. She was the first woman to earn the M.A. in Comm. at Penn and the only woman in the first graduating class of the Annenberg School. In November the University opened the new Women’s Residence Hall at the northeast corner of Thirty-Fourth and Walnut Streets. It was the first building at Penn designed and constructed exclusively for women students. (The Women’s Residence Hall was re-named Hill House in 1965). Also in November, Wellesley College, in Wellesley, Massachusetts, announced the appointment of Laura Bornholdt as Dean of its College and Professor of History, effective July 1961. Dr. Bornholdt served as Dean of Women at Penn from September 1959 to June 1961. Also in November, the Graduate School of Medicine promoted Helena Emma Riggs (A.B. 1921, M.D. 1925) from Assistant Professor of Pathology to Professor of Neuropathology in the Department of Pathology. In 1950, she had been the second woman to join the standing faculty in the Graduate School of Medicine. Now she was the first woman to earn tenure in the Graduate School of Medicine and the first to hold a senior professorship in that School. In January, the University conducted formal dedicatory ceremonies at the Women’s Residence Hall. Funding for the $4 million building came principally from the Federal Housing and Home Finance Agency, but the interior design and furnishings were greatly enhanced by the generosity of alumnae and other friends of the University. Althea K. Hottel, Trustee of the University and former Dean of Women, was Chair of the Residence Campaign and Dedication Ceremony. Rheva H. Shryock was President of the Association of Alumnae. Mrs. Shryock presented citations of honorary membership in the Association to Mrs. William S. Peace and Mrs. W.H. Biester, Jr., who had served as Co-Chairs of the Committee for Philadelphia House. These were the non-alumnae friends of the University who contributed funds to the Women’s Residence Hall. President Harnwell presented the key to the new Residence to Kathryn Gray, who was President of the Women Students’ Government Association, who, in turn, presented it to Martha Taylor, who was President of the Residents’ Student Council. Agnes Repplier (1855-1950) (Hon. Litt.D., 1902), literature. Virginia Margaret Alexander (B.S. in Ed., 1920), medicine. The alumnae of the University contributed the second house. It was named Alumnae House and included a formal lounge, which the Association of Alumnae named the Althea Kratz Hottel Lounge. The third house was named for Frances Holwell, the first woman to direct the 18th century Charity School of the University. The fourth was named for Carrie Burnham Kilgore (LL.B., 1883), the first woman graduate of the Law School of the University. Sara Yorke Stevenson (Hon. Sc.D., 1894), founder of the University Museum and first woman recipient of an honorary degree at Penn. The Women’s Residence Hall was a celebration of all the achievements of women at Penn from 1753 to 1961. It was intended to be the new center for women’s student life at Penn. At the Commencement held on 5 June, the University awarded the degree of Bachelor of Science in Chemistry to Phyllis Paula Fine. She was the first woman to earn the B.S. in Ch. degree at Penn. In July, the University announced the appointment of Constance P. Dent, B.A., M.A., Ph.D., to the senior administrative position of Dean of Women. Prior to accepting her appointment at Penn, Dr. Dent was Dean of Women and Associate Professor at Glassboro State College in Glassboro, New Jersey. She earned the degree of Bachelor of Arts in psychology and biology at Bucknell University in 1945; the degree of Master of Arts in psychology from Temple University in 1951; and the degree of Doctor of Philosophy in clinical psychology from Pennsylvania State University in 1958. She had completed her Ph.D. with the assistance of a fellowship awarded her by the American Association of University Women. Althea Kratz Hottel had participated in the award of the fellowship and thought highly of Dr. Dent. In December, the Trustees of Bucknell University elected Dr. Dent a fellow Trustee of the University. Dr. Dent served as Dean of Women at Penn from July 1961 through June 1966, when she accepted an appointment of Professor of Psychology at Kutztown State College (now Kutztown University). Sharon Lee Ribner, College for Women, Class of 1964, was the first woman to join the staff of the men’s student newspaper, the Daily Pennsylvanian. She was a member of the Junior Board in 1962-63 and the Senior Board in 1963-64. At the Commencement held on 21 May, the University awarded the degree of Bachelor of Science in Mechanical Engineering to Mary Jane Orloski. She was the first woman to earn the B.S. in M.E. degree at Penn. Also at the Commencement of May 1962, the University awarded the degree of Bachelor of Architectural Engineering to Elizabeth M. Boggs. She was the first woman to earn the B. Arch. Eng. degree at Penn. The School of Veterinary Medicine promoted Monica Reynolds, B.S., A.B., Ph.D., from Assistant Professor of Physiology to Associate Professor of Physiology in the Department of Animal Biology. She was the first woman to earn tenure in the School of Veterinary Medicine. In 1969 she was promoted to Professor of Physiology, the first woman to hold a senior professorship in the School of Veterinary Medicine. At the Commencement held on 20 May, the University awarded the degree of Master of Science in Engineering to Judith Ann Maestrelli. She was the first woman to earn the M.S.E. degree at Penn. Also at the Commencement of May 1963, the University awarded the degree of Master of Science in Nursing to twenty-eight women. These graduates were the first women to earn the M.S.N. degree at Penn. Also in May, the Trustees appointed a woman Trustee, Katharine Elizabeth McBride, to the first Joint Committee of the Annenberg School of Communications and the Trustees of the University of Pennsylvania. The purpose of this decision-making, executive committee of the Annenberg School was to “discharge the responsibility of the Trustees of the University in the joint operation and control of the educational program.” Dr. McBride was the first woman member of the Joint Committee. In July, the University established the Pennsylvania Program of Continuing Education for Women, which was designed to attract “women beyond college age who have the will and capacity for further study.” The program was made possible in its first two years by the Carnegie Corporation of New York, which funded it through substantial grants to the College of Liberal Arts for Women. Virginia Kinsman Henderson (B.S. in Ed., 1930; M.A. in Psychology, 1936) was appointed the first Director of Continuing Education. The first women to enroll in the program began classes in September. The University announced the merger of the faculties of the School of Medicine and Graduate School of Medicine in a single faculty. The Graduate School of Medicine became the Division of Graduate Medicine of the School of Medicine. The dental courses in basic sciences formerly offered in the School of Medicine, Division of Graduate Medicine, were transferred to the School of Dental Medicine, where they and their faculty became the Division of Advanced Dental Education. The medical and veterinary courses in basic sciences were transferred to the Graduate School of Arts and Sciences. The Division of Graduate Medicine in the School of Medicine offered the degrees of Master of Science in medical, dental, and veterinary clinical specialties. It also continued to offer the Doctor of Science in the clinical specialties of all three disciplines. Within the Division, the Department of Preventive Medicine continued to offer advanced degrees in public health, both the Master of Medical Science and Doctor of Medical Science. Stella Y. Botelho (A.B., 1940), M.D., Associate Professor of Physiology and Pharmacology (Instructor, 1949-50; Associate, 1950-53; Assistant Professor, 1954-57; Associate Professor, 1957-69; Professor of Physiology, 1969-85; Professor Emeritus, 1985-present; Alumni Award of Merit, 1968). Adele K. Friedman, B.A., M.D., M.Sc. (Med. ), Clinical Assistant Professor of Radiology (Associate Professor of Radiology (but without tenure), 1972-86; Associate Professor of Radiology in the Associated Faculty, 1986-). Mary Elizabeth Baumann (B.S.N., 1957), Assistant Professor of Oral Histology and Pathology. In June, the University appointed Dorothy Ann Mereness, A.B., R.N., M. Litt., Ed.D., to the senior academic administrator position of Dean of the School of Nursing. She was the second woman to be appointed Dean of this School and the fourth woman to be named an academic dean at Penn. Also in 1965, Zenovia Alice Sochor (A.B., 1965) was the first woman at Penn to be named a Thouron Fellow. In the spring semester, Penn’s undergraduate students elected Barbara Berger (A.B., 1967) the first President of the merged Student Government Association. She thereby became the first woman President of an Ivy League student government. In October 1980, Barbara (Berger) Opotowsky returned to Penn as a Dean’s “Visiting Fellow” of the Faculty of Arts and Sciences. She had become a lawyer and was the first woman to head New York City’s Better Business Bureau. In May, the University announced the appointment of Alice F. Emerson, B.A., Ph.D., to the senior administrative position of Acting Dean of Women and the faculty position of Assistant Professor of Political Science. Prior to accepting her appointment at Penn, Dr. Emerson was a Lecturer in Political Science at Bryn Mawr College. In November, the Trustees elected Dr. Emerson to the position of Dean of Women. In April 1969, the Trustees changed the title of Dean of Women to Dean of Students. Alice Emerson was the first woman at Penn to hold the title of Dean of Students. At the Commencement held on 22 May, the University awarded the degree of Bachelor of Science in Metallurgical Engineering to Anne Judith Apter. She was the first woman to earn the B.S. in Metal. E. at Penn. Also at the Commencement of 1967, the University awarded the Wharton School’s degree of Master of Science in Accounting to Virginia Leigh Swope. She was the first woman to earn the M.S. in Accounting degree at Penn and the only woman in the first class of Wharton School graduates to earn this degree. After more than fifty years of separate events, the women’s and men’s Hey Day ceremonies were merged in a single, co-educational program. During the traditional Hey Day observances, the University conferred awards and honors on its most accomplished undergraduate students. In December, the Trustees established the “Professional Board for the School of Veterinary Medicine” and elected fourteen persons as Associate Trustees of the University with membership on this professional board. Two members of the first Board were women: Marietta Springer Patterson (“Mrs. William D. Patterson”) and Ella A. Widener Wetherill (“Mrs. Cortright Wetherill”). They were the first women whose oversight responsibilities were sought solely for the benefit of the School of Veterinary Medicine.